Lego female scientists: LegoAcademics Twitter account makes fun of university life. Tiny female scientists fight paperwork, administrative duties, and dinosaurs. 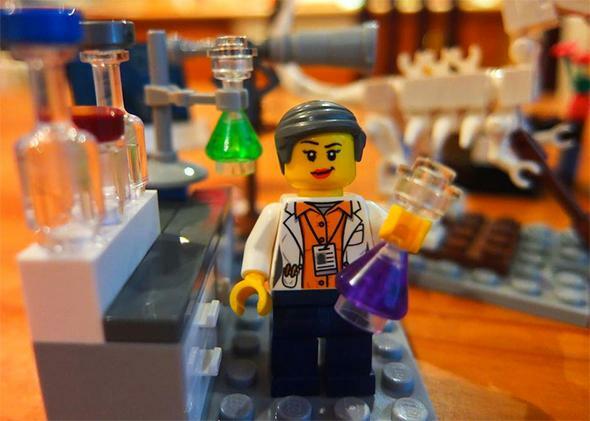 When Lego launched its first line of female scientists earlier this month, archaeologist Donna Yates of the University of Glasgow was one of the first to buy a set. She created scenes of the mini scientists experiencing the trials and tribulations of everyday academic life, then photographed them and posted them on Twitter—to the delight of 30,000 followers and counting. Jessica Hamzelou asks her why everyone loves the tiny scientists. How was Lego Academics born? The Lego arrived in the post while my colleague and I were working on a load of paperwork that I had completely messed up. We were annoyed, and it was rainy and horrible out, so we started playing with the Lego. As the day went on, we started expressing our frustrations. I took some pictures of the characters with my phone and put them on my Twitter account, and people reacted quite positively. After I walked home, I realized I had left my keys in the office, so I walked all the way back in the rain. While I was walking I had the idea of making a separate Twitter account for fun. And it became surprisingly popular. Their bodies, faces, and hair change, so they are not really set, but all of the scenes are pretty much based on reality. The scenes are just funnied-up versions of my personal experiences or those of colleagues. Recently, there was an offer of free lanyards in our building, and the excitement in the office was so high: That’s a typical example. All of the characters have Ph.D.s. Dr. Red is probably me, because she looks like me, with her red hair and glasses. The scenes are funny, but are they making any serious points? I hope they come across as good-natured and light, and I don’t think any of them are really picking a bone with the system. People follow them with a sense of delight because they are normal office frustrations. The bigger point is that we show female scientists going through this, and that’s part of the excitement surrounding the Lego set and the account—not just the academic jokes, but the fact that these are female academics in normal academic situations, being normal scientists. I’m not making jokes about their gender, but normalizing the idea of a female scientist. That’s the reason I bought the set in the first place. The Lego set was created after geologist Ellen Kooijman proposed the idea and gained more than 10,000 online supporters. But sets quickly sold out and Lego has not announced plans to produce more. How do you feel about that? I’m a bit sad that there isn’t a plan to put out any more. I haven’t heard anything official. I’ve thought about starting a petition to see whether we can get more made. But the creation of the set was a good step. I was pretty happy with how it was marketed—the box isn’t pink, and it doesn’t say “female” anywhere. It seems to have been marketed in such a way as to appeal to boys, too. One set of toys isn’t going to erase this terrible pink-cupcake-beauty-shop bent to most toys for girls, but it’s a good start. How have academics themselves responded to Lego Academics? What next for the Lego Academics? The rampaging dinosaur (a skeleton that appears to chase the scientists in an image captioned “PUBLISH OR PERISH!!! !”) will come back. I see the dinosaur as the evil voice inside every academic’s head that’s telling them to do better work, and slightly undermining everything they do. So there will at least be another one of him rampaging again. Would you recommend a career in academia? Absolutely. It is the best. Like anything, it has its problems, and there is a lot of pressure to do good work. But ultimately, this is a job that allows you to spend your life exploring and solving riddles and problems.